Use these rune stones for divination purposes, rituals and spells, or just use them as decoration in your humble abode! 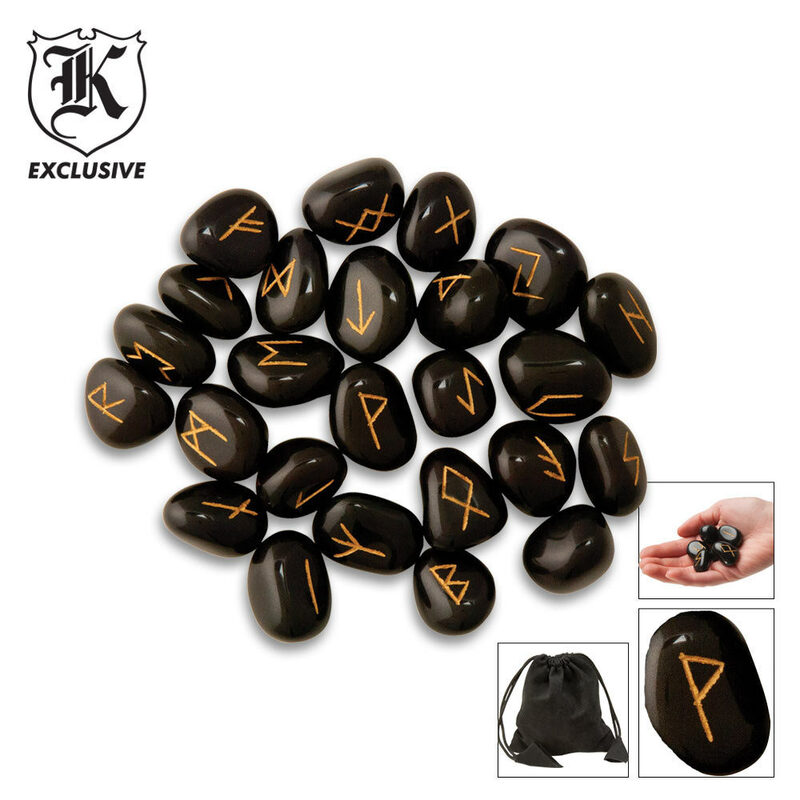 These black glass rune stones come as a set of 24 with gold-painted lettering. Each set includes a black drawstring velvet bag. When these came I had to check to make sure they didn't send me a more expensive set by mistake! I was just looking for some "starter" runes to tide me over until I could buy or make a nicer set but I don't think that's going to be necessary! They say they're glass but they have the look and feel of stone. Each one is weighty and substantial. Whether or not you think runes have power is subjective, but these definitely don't feel like you're working with something generic or mass produced. Doesn't matter if you're a rune caster or just someone who appreciates the aesthetic of the Elder Futhark, these beautiful rune stones are a sight to behold. The moment you feel the weight of them in your hand you will know you've gotten your money's worth. These came just as perfect as the $25 ones you'll find in retail shops. They have the look and feel of obsidian stone with only a couple cosmetics blemishes. The inscriptions are clear, straight, and cleanly filled with a rich shimmery gold paint. The faux velvet bag is quite nice with a strong cord. Very satisfied customer here. These things are AWESOME!!! I can not begin to tell you how perfect these thing look. The weight, the engraving, the color of the stones.. I was doubtful, but I am glad I took the chance. If you are into the Norse culture, LARP or anything similar, GET THESE!! They will make a PERFECT addition to your collection!! The pouch isn't too bad either ! Depending on your religious / psionic / views is what you would use these for. As well as how many make up the set. 24 or 25. These contain 25 (the blank one). Very pleased. H.S. A great decorative piece to any buyer on this site. These are great. They have a nice look and feel. Although I received 25 stones. Great product though. Really good for decoration and use.